These are 1/2" replacement bingo balls for the BingoShop Small Bingo Cage. The balls are multicolored and easily read. A small bingo cage for occasional bingo players, the balls are only a half inch in diameter. 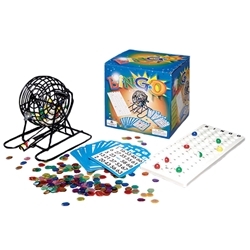 The cage comes with a set of balls, a masterboard, 18 reusable cardboard bingo cards, and 150 bingo chips to use as markers. Everything you need to get started playing Bingo!